Costuming Drama: Proof! 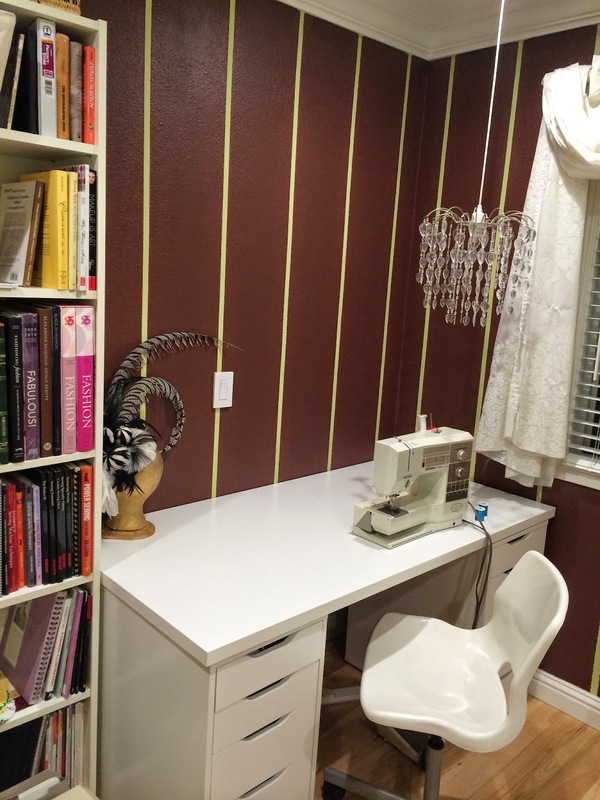 And also my sewing room! 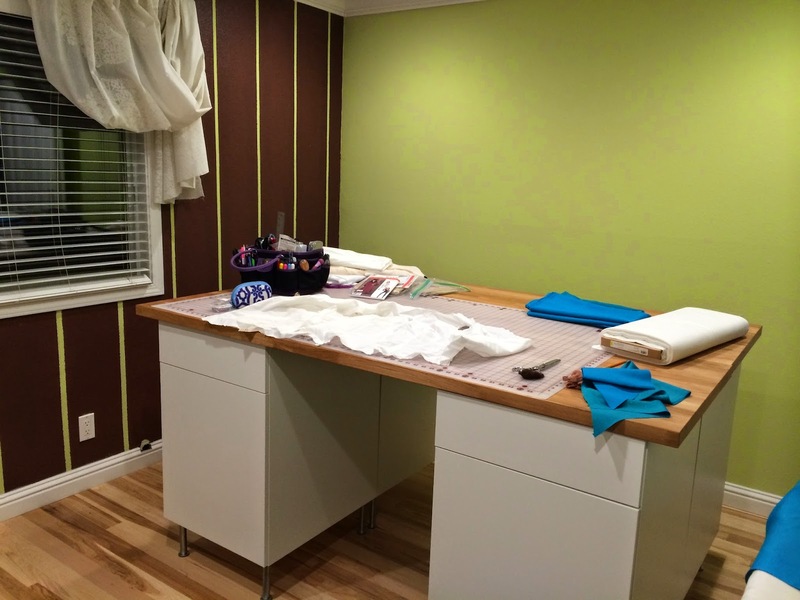 I just realized, while cutting my skirt fabric, that I had not shown my new sewing room! It's far from done and there are no pictures on the walls, and it is currently not tidy, because I am in the middle of utilizing the furniture but I thought I'd show proof that I am working on stuff and also show my space at the same time, so here you go! Yes, my room is chartreuse and brown with stripey walls. No, I did not paint it, it came that way. Yes, I love it and am leaving it that way! Here's my cutting table! I took a page out of my buddy, Other Noelle, 's book and went to Ikea. I got myself* 4 kitchen cabinets that are extra wide and extra deep and have cabinets and drawers. I put those in a clover leaf and then topped it with two kitchen counter tops that are 6 feet wide. The whole thing is just over four feet wide by 6 feet long and clocks in at 38 inches tall with the 6 inch risers on the bottom. It is the PERFECT height to cut on. My back has never felt this good while working! It doesn't look that tall in this picture, but it comes well up to my natural waist. The best part about it is that I can walk all the way around it to get at things from almost any angle! The inside of all 4 cabinets serves as fabric storage (there's more in the garage). Each one of these holds way more fabric than I thought - about a storage bin and a half - so I'm pretty pleased! 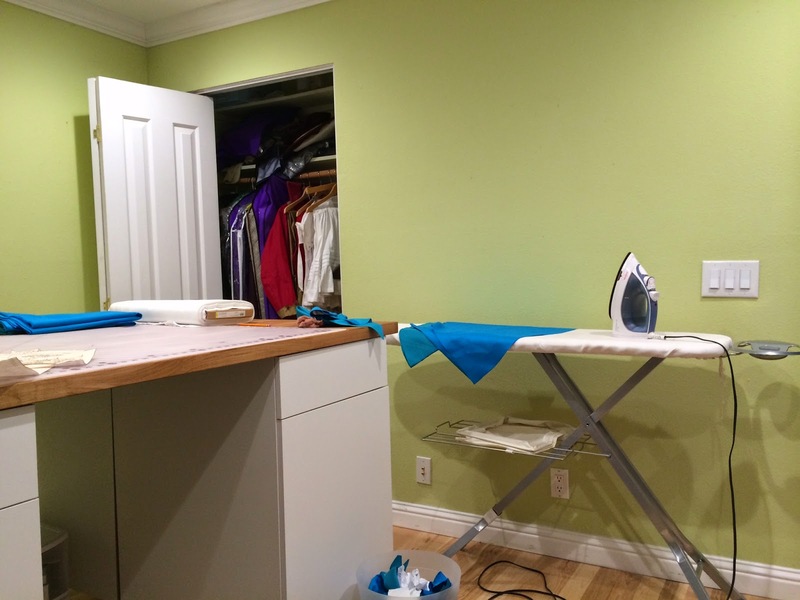 Lastly, there's a currently naked wall that may someday hold a TV, or it may hold a whiteboard, but will probably always hold the ironing board! There's also a nice closet in this room for holding my done costumes! So, that's my room so far! I will update again with pictures when I am done filling it out, but I thought I should share since I am finally getting to flex the muscle of this awesome space! *When I say "I got myself, what I really mean is that my wonderful and generous husband bought me a crap-ton of awesome furniture at the drop of a hat because he is the best guy ever!